DAVID LE/Staff photo. 2/18/15. 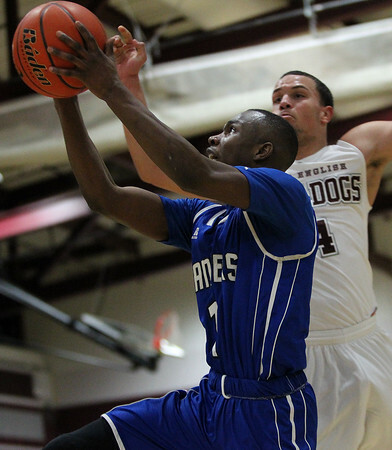 Danvers junior forward Rashad Francois (1) makes a power move to the basket and banks in a layup before Lynn English senior forward Jordon Lark, right, can soar in for the block on Wednesday evening at Lynn English High School. The Falcons pulled off a 79-78 last second win over the Bulldogs on a Devan Harris free throw after he was fouled on a last second attempt.